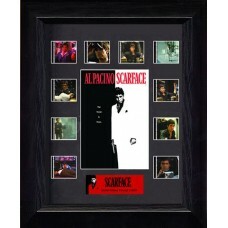 Scarface (S3) Mini Montage Film Cell sale Canada Brian De Palma's tale focuses on a Cuban immigrant (Al Pacino) who becomes the head of a Miami drug cartel. Pacino plays Tony Montana, a lowly dishwasher with big-time ambition. He rises through the ranks, eventually becoming rich and powerful, but his cocaine-fueled paranoia and other unsavory personality traits lead to his undoing.